The simplicity of the Fox Racing Pee Wee Motocross Elbow Guards, make it an easy choice for those just starting out. Without restricting arm movement, the Pee Wee Motocross Elbow Guards offer great impact and abrasion resistance. The Fox Racing Pee Wee Motocross Elbow Guards easy-to-use adjustable strap system, for parents and child, soft backing material, and a tough plastic elbow and forearm coverage, go on fast and stay out of the way. Smaller design specifically geared for children aged 4-11. Provides great protection for my 6 year old. A little bulky, but that's what makes it protect well. I recommend. Made for 8 and under, fits great on my 6 year old, not as much protection that I'd like but so far does the job. My son doesn't complaint about fit and he is very picky. Bought these for my 6 year old daughter and fit and finish seem good. The padding is a little lite, not as tough as you would expect from a MX pad, and feel like they would easily get torn if worn outside of a shirt. There aren't to many options for padding at this age, so these are serviceable, but I'm not sure they'd really hold up in a wreck. We run all Fox gear and these are holding up great. Never too much protection for the little guys. great gear for the little guys. flexible and durable. Fox makes some of the best gear out there. Got these on clearance and they have been great. Very comfortable for my daughter. The Fox Racing Pee Wee Elbow guards fit my 5 year old great. He has room to grow into them and they seem like they will not wear out. He is a thin 5 year old, so they might fit bigger built kids might fit it differently. Over all exactly what i expected. Both my eight year old daughter and my five year old son wear these. They have been great. They stay in place and offer good protection. My five year old has really put them to the test with regular tip overs. He hasn't lost any skin on his elbows with these guards on. He has pulled a few stitches of thread out of them, but they are still perfectly functional. 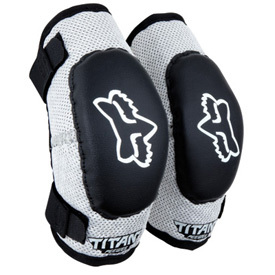 Having these elbow pads along with gloves and knee pads has been a great encouragement to my kids for riding. They are not as afraid to ride because little falls don't hurt anymore. Prevents a lot of scrapes and bruises. Do your child a favor and get these. Great for bicycle riding too! Nothing special, cheap elbow pads. These have been great for my 12 year old. He loves them. Fits my five year old great.